This green garlic alfredo sauce is delicious and versatile! Serve it as a dip alongside some crunchy raw vegetables or spoon it over some paleo pasta. My recipe is paleo-friendly and thereby also dairy-free. It’s “cheesy” and garlicky. If you can tolerate dairy, you can try using heavy cream instead of full-fat coconut milk and parmesan cheese instead of nutritional yeast. The recipe to make this simple sauce is easy, you just need to get your hands on some green garlic. Green garlic, also known as spring garlic, is in season right now but only for a couple more weeks! Green garlic = garlic that hasn’t matured yet. It looks like a scallion/green onion, but it has a delicate garlicky flavor. You can find this at your local farmers market. I bought this bunch below for $1 – what a steal, right? What’s kind of neat is that green garlic is a byproduct of garlic – farmers remove the young plants (green garlic) to prevent overcrowding. But these days it seems like green garlic is a hot commodity in itself! There are so many people and chefs who look forward to green garlic season. 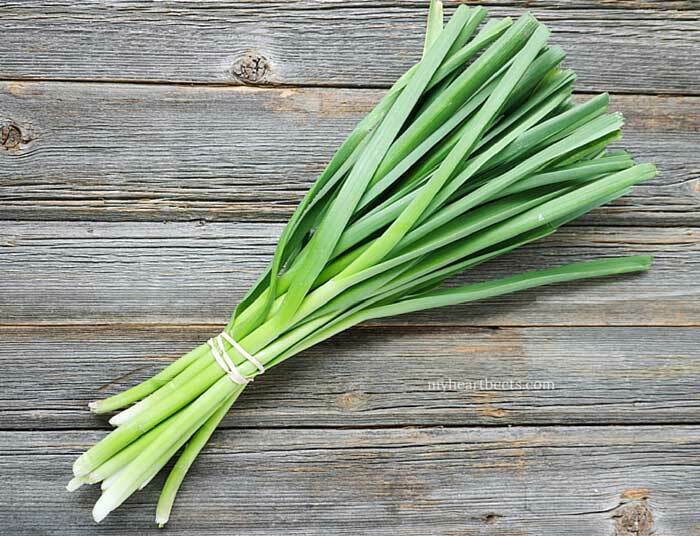 You can use green garlic the same way you use scallions – in stir-fries, omelets, etc. 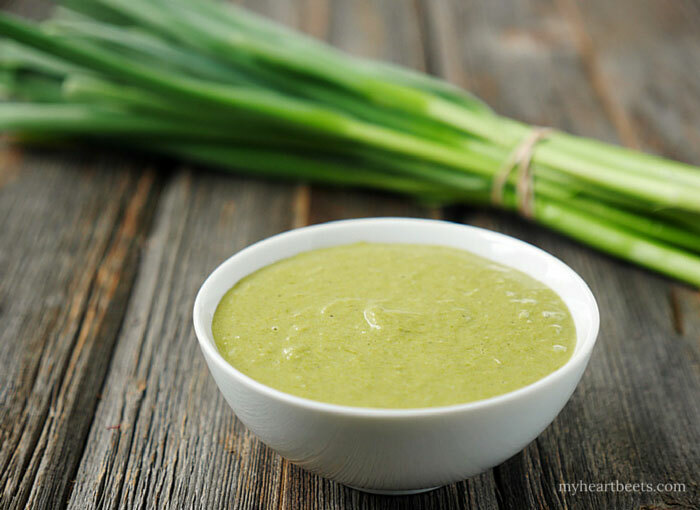 I decided to use mine to make this green garlic sauce. I ate it overtop of some gluten-free gnocchi (Capellos brand), but I think next time I’ll opt for their fettuccine instead (I like it better). I hope everyone is enjoying the season and the awesome produce that it brings! Heat olive oil in a pot over medium heat. Add the green garlic and saute for 3-4 minutes. Add the coconut milk, reduce heat to low and simmer with lid on for 20 minutes. Keep an eye on the sauce to make sure doesn’t overflow. Remove the lid, add the nutritional yeast and simmer with the lid on for another 5 mins. If the sauce is too thick, you can thin it out with a little hot water. Oh my!! This is SOOO good! Thank you for sharing this recipe.